Retro Australiana meets Palm Springs with a standing gymea lily bouquet and an abundance of native varieties at the Pink Cliffs in Heathcote. A unique rainbow flower veil and bright lines of flowers draped from an arch and across the furniture at the Church of Bang Bang Boogaloo in Melbourne. Wearing avante garde floral pieces while sitting pretty in plush vintage settings adorned with blossom at Fitzroy Gardens in Melbourne. Big bunches of wattle, eucalyptus foliage and waxflower hung from light rods and bright flowers around the room at The Line in Footscray. The rich colour of the market meets the city at Alto in Melbourne, with an overflow of flowers and foliage from baskets, and a decadent table setting. 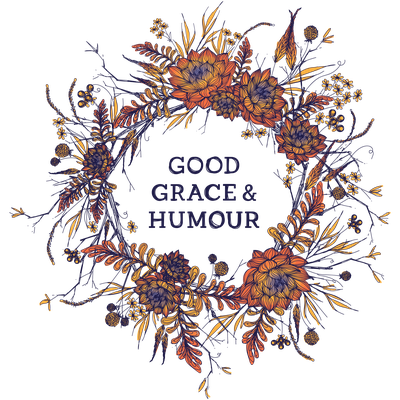 All images and text copyright Good Grace & Humour 2017 – , except where photography is credited.